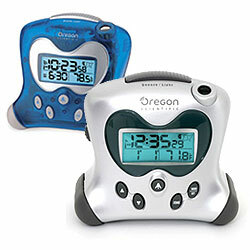 These attractive desk top clocks are a great gift for anyone looking to decorate a chic office space or as a charming accent piece on a fireplace mantel. Packaged with a powerful 12-volt bed shaker. Hi/low dimmer switch for better night vision. Extra loud audio alarm, loud 113db adjustable tone & volume control. The Bombs got your back with Battery backup, maintains time and alarm setting in the event of power failure. 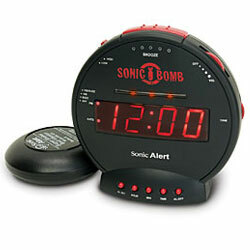 1 Year Sonic Alert blast proof warranty. The Bomb comes with a 110 volt power supply, also will work with an optional 220 volt transformer. Our SBH400ss clock comes with a 110 volt power supply, will work with an optional 220 volt transformer. Clock also has two switches one allowing user to switch from 60Hz / 110 volts or 50Hz / 220 volts. This feature keeps proper time with 110 or 220 volts. Another switch allows user to select 12/24 hour time. Simple, easy, and functional! 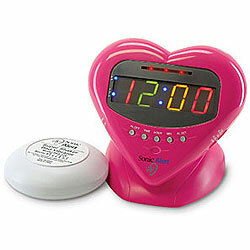 These cool little clocks automatically set to the U.S. Atomic Clock and never need adjusting for Daylight Saving Time. The projection feature offers a unique way to read time in the dark by casting soft glowing red numbers on a wall, ceiling, or just about any surface. Comes in a cool translucent blue or a sleek silver design.